After a long and colorful life working in munitions and getting entangled in the Spanish Civil War, the Manhattan Project, and other definitive events of the 20th century, Allan Karlsson finds himself stuck in a nursing home. 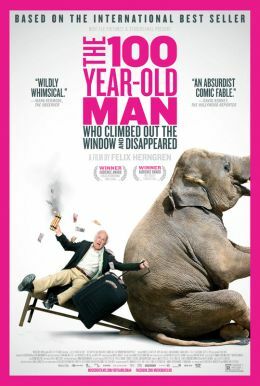 Determined to escape on his 100th birthday, he leaps out of a window and onto the nearest bus, kicking off an unexpected journey involving, among other surprises, a suitcase stuffed with cash, some wicked criminals, and an elephant named Sonya. Like an unruly Nordic cousin of Forrest Gump, Allan’s youthful escapades and current adventures weave together into an offbeat treat for anyone who’s young at heart. Starring beloved comedian Robert Gustafsson, this fanciful spin on world history is based on a best-selling novel and also the highest-grossing Swedish film of all time.